Remember that two month period this summer when God didn’t seem to hate Cleveland so much? For the second time in four years, David Stern’s ping-pong balls went the Cavaliers way, this time yielding them supposed once in a generation talent Andrew Wiggins. Not long thereafter LeBron James announced his decision to return to Ohio, instantly making Cleveland the 2015 Eastern Conference Title favorites while also producing yet another wave of “I’m Coming Home” montages (reinforcing that Skylar Gray will always have more money than most small countries). Revolutionary offensive mind David Blatt was coming over from Europe to coach this rejuvenated franchise, the Indians were contenders for the second straight season, and Johnny Football remained immune to haters due to the large stack of cash being held in his hand. We shouldn’t have been so naive. While the Indians future remains bright, Johnny was finally humbled by his lackluster play on the gridiron (that’s putting it lightly), and the Cavs find themselves just a game above the .500 mark at the NBA’s midway point. Andrew Wiggins is no longer, David Blatt may not have much longer, and Kevin Love’s future in Cleveland is far from stable despite his quasi-nightly reassurances to the media about “being in it for the long haul.” What six months ago appeared to be a time for optimism and excitement in the city of Cleveland, has morphed into another torturous example of history repeating itself. While I won’t speak to God’s involvement in the Cavaliers 21-20 start (that’s Simmons’ corner), it’s clear that Cleveland is looking at more than just small-sample flukiness with the All-Star break fast approaching. However, despite the myriad of columns being written about Cleveland’s lack of leadership, as well as the cringe-worthy dissection of The Shove (more of a flop by Blatt if you want my true opinion), it’s not time to hit the panic button on this Cavs season, or Cleveland’s future in general, quite yet (Cleveland’s back to back wins in Los Angeles on Thursday and Friday night helped slow the onslaught of national media criticism, for which we should all be thankful). In the span of four days earlier this month, GM David Griffin parlayed notorious chucker Dion Waiters and Memphis’s 2015 first rounder (heavily protected until 2017, becomes fully unprotected in 2019) into two wings, J.R. Smith and Iman Shumpert, and a center, Timofey Mozgov. While most likely having to pay Smith’s 6 million dollar player option next season isn’t ideal, the Cavs are already over the tax for 2016 and will have minimal flexibility this summer when going after free agents. Assuming Smith is a slight upgrade over Waiters (despite the age discrepancy, Smith is a better shooter than Waiters and provides more on the defensive end assuming he’s engaged and/or it’s not a Sunday afternoon), the opportunity cost for two sorely needed role players (Shumpert and Mozgov) was one first round pick that Denver most likely won’t be receiving for another 2-3 years. With free agency not a great or realistic option at this point (unless Love leaves, which we’ll get to), acquiring reinforcements via low risk trades is Cleveland’s best hope for turning their ship around. In Mozgov, the Cavs attained what they so sorely lacked after Anderson Varejao tore his Achilles in late December; a big who can protect the rim and soak up rebounds while Cleveland plays around with smaller, more shooter centric lineups. Mozgov isn’t a great defender by any means, and his on/off court numbers in Denver would suggest that he actually hurts you defensively (The Nuggets were 4.8 points per 100 possessions better defensively with Mozgov sitting). However, much of the blame for that seemingly wretched mark falls upon Mozgov’s former frontcourt mate Kenneth Faired, a well known defensive siv who’s woes forced Mozgov out of the paint on help assignments more often than coach Brian Shaw would’ve liked. When Mozgov was in the paint, he held opponents to under 50% shooting at the rim per the NBA.com stats database, an impressive number that puts him alongside names like Deandre Jordan and Andre Drummond. The Cavs hope Mozgov’s solid rim protection will help sure up what has been one of the worst interior defensive units in all of basketball this season. Cleveland has allowed opponents to shoot over 64% from the restricted area, putting them ahead of only Sacramento (Vivek!!!) and Minnesota as the worst interior defenses in basketball. Even the simplest actions, such as pick and rolls and off-ball cuts get the Cavs scrambling, leaving open driving lanes all over the floor for opposing teams to take advantage of. Here (55 second mark), LeBron and Mike Miller botch a simple weak-side switch off a Miami pick and roll, leading to an easy look in the paint for Dwyane Wade. Both James and Miller stand helplessly on the perimeter as Love elects to shield himself behind the body of Hassan Whiteside vs. actually trying to contest Wade’s 5 footer. Other times, baseline drives such Loul Deng’s above (1 minute 22 second mark), cause Cleveland’s defense to collapse entirely, this time leaving Wade with a wide open corner three as all five Cavs stand idly by in the paint. Having an anchor in the middle will help to alleviate some of these pains, but Mozgov himself can’t remedy a defense whose 106.3 points allowed per 100 possessions are good for 5th worst in the Association (the bottom four, Utah, L.A., New York, and Minnesota have a combined 36-119 record). Having LeBron back in peak physical form after an eight game hiatus will, and already has helped tremendously. James was not his usual defensive self early in the season, often falling victim to backdoor cuts and botched switches (as seen above) as a result of ball-watching, laziness, and overall apathy. This shouldn’t have come as a shock; The King has logged over 40,000 minutes in his pro-career to date, including four straight Finals trips and an Olympic Gold medal run in the Summer of 2012. It’s only natural to experience mental and physical fatigue after a workload that heavy, and it manifested itself on the court over Cleveland’s first thirty games. Since his return, James has been much more engaged on defense (a few strange lapses Thursday night non withstanding), shutting down Markieff Morris late in the fourth quarter Tuesday night against the Suns and doing a decent job slowing Blake Griffin in the post on Friday night in L.A. This renewed effectiveness, paired with the looming return of Iman Shumpert from a dislocated shoulder next week, could push Cleveland out of the bottom five and into the middle of the pack in defensive efficiency. 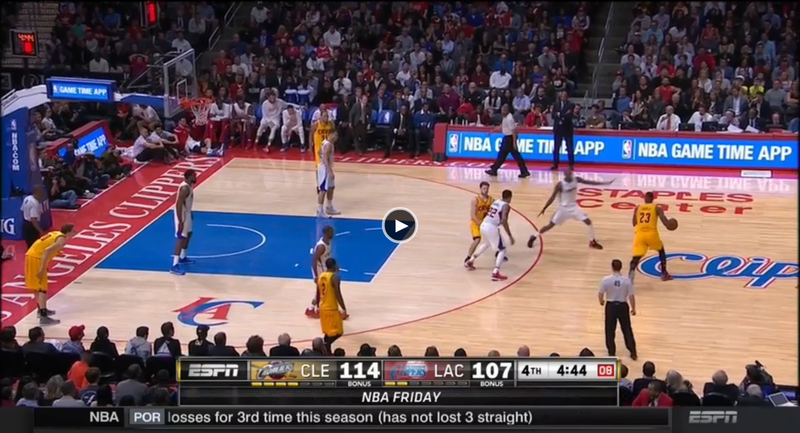 There’s a fly in this defensive ointment however, and his name is Kevin Love. For the Cavs to become competent defensively, something that is necessary if they wish to regain contender status in the East, they have to figure out an effective way of hiding Love when they don’t possess the basketball. Love has been horrendous guarding the screener in pick and roll situations, often yielding wide open three pointers to opposing stretch fours or allowing his man to drive uncontested into the lane while he helplessly looks on. In the sequence shown above, Love goes with the ball handler on a side P&R, leaving his man, Markieff Morris, wide open for an uncontested three. 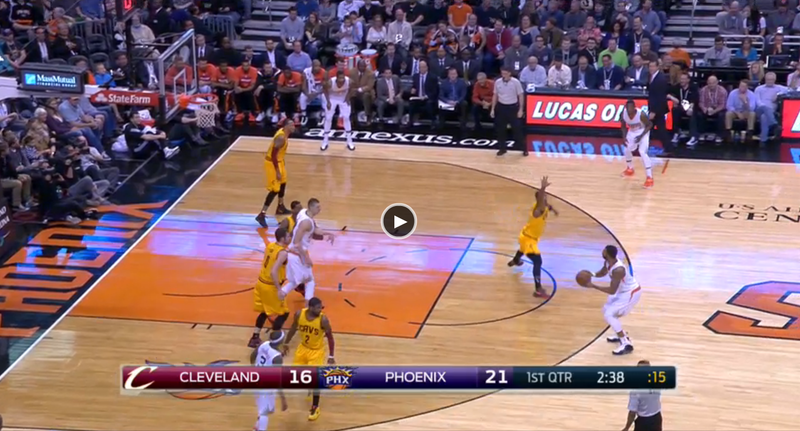 J.R. Smith’s late attempt to rotate over and contest the shot is unsuccessful as Morris knocks down the shot with ease. Part of the blame for plays like this fall on Blatt; if Love had stuck with Morris there’s a chance the ball handler (Isaiah Thomas) would’ve had an uncontested driving lane himself. 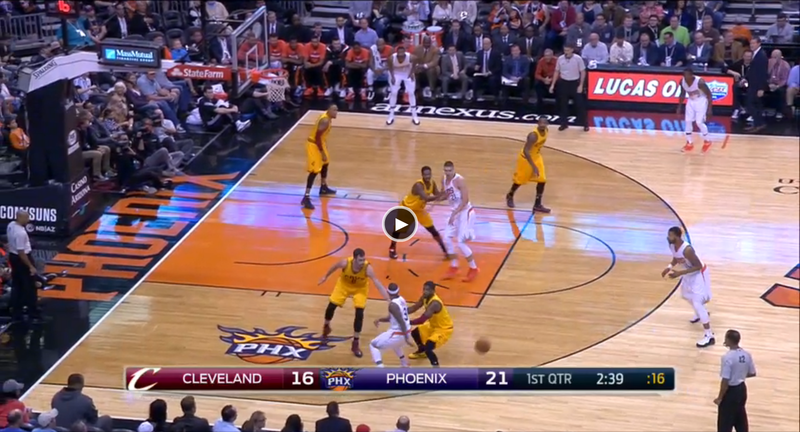 By implementing a hard trapping scheme against good shooting teams like Phoenix, not unlike Miami’s old blitzing strategy, Cleveland may force more turnovers while giving up less wide open three point attempts. There’s no guarantee this would work; Love can’t even hold his own in simple one-on-one/isolation situations, but at the very least it would make opponents work harder to find open looks when the former Minnesota power forward is on the floor. Another intriguing option for Blatt, and a luxury he is afforded in the wretched Eastern Conference, is to scale back Love’s minutes and explore smaller, more defensively sound lineups. Blatt did this against Phoenix, benching Love in the fourth quarter and going small, a decision that showed promise as Cleveland held the Suns to just 22 fourth quarter points. 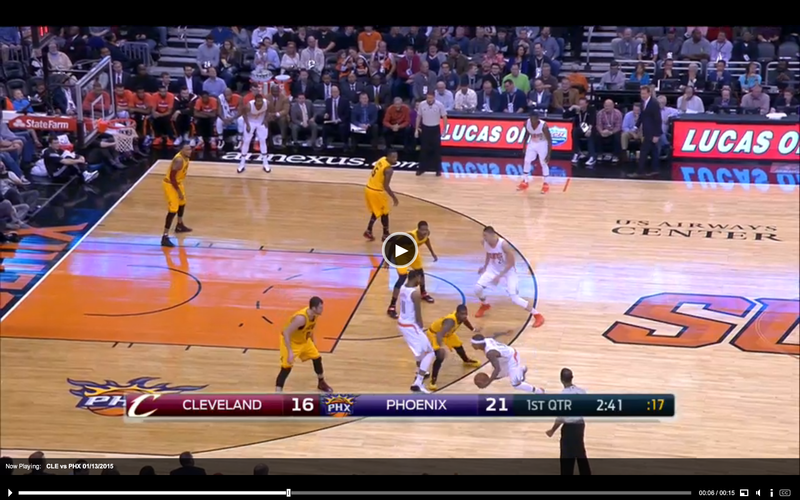 By playing some combination of Mozgov, Thompson, James, and Shawn Marion in the frontcourt, Cleveland sacrifices rebounding but improves significantly defending actions like the one’s pictured above. According to the NBA.com stats database, Cleveland’s two best two-man lineups by NetRating (minimum 20 games played) feature LeBron alongside Thompson and Marion, improving the Cavs defense while remaining dynamic on the offensive end. Going smaller more often would come with an added benefit for Blatt: increased pace of play. Whether Love is on the court or not, Blatt continues to stifle his team’s efficiency by allowing them to play at the leagues sixth slowest pace. An offense with Kyrie Irving, James, and Love as it’s primary scorers would be much better suited pushing the tempo on a consistent basis, leading to more transition opportunities for the worlds best player. Too often, especially at the ends of games, Cleveland waits until the shot clock hits single digits before even beginning to get into an offensive set. Many times, such sets include nothing more than Thompson (or in the example above, guard Matthew Dellavedova) screening for James or Irving outside the three point line as everyone else clears out of the lane. While this is better than what most teams have in their offensive arsenal (boy would I kill for some LeBron late in the clock jumpers in New York right now), Cleveland would be better served dictating pace of play and letting the speed and athleticism of Irving and James overwhelm their opposition. The fact that Kyrie Irving is one of the twelve best pull-up shooters in basketball, or that Tristan Thompson averages just under four offensive rebounds per game only increases the impetus for Cleveland to play faster and maximize transition opportunities. Friday night’s win over the Clippers was a perfect example of why it’s too early to count out Cleveland halfway through the season. With Love sitting due to injury, Blatt used some of the smaller lineups discussed above, leading to a season high in points for Thompson and the third straight 30 point game from James. Blatt’s squad still seemed averse to pushing the tempo, although Shumpert’s insertion into the rotation may force Cleveland to play faster, with the added steals he brings ideally leading to more fast-break opportunities. Regardless, it was the Cavs first signature road win all season, proving that it’s still too early to pencil in Atlanta and Chicago as the East’s two finalists in 2015. There is one final storyline that will remain ongoing throughout the remainder of the season, whether Cleveland rights the ship or not: Love’s future as a Cav. Despite remaining adamant towards the media that he doesn’t plan to opt-out of his 2015-16 player option come summer time, many believe it’s inevitable that Love will test the free agent waters once this season comes to a close. What three months ago seemed inconceivable (Love jumping ship after seasons end) is now a legitimate possibility, a thought surely floating around in the mind of one David Griffin. 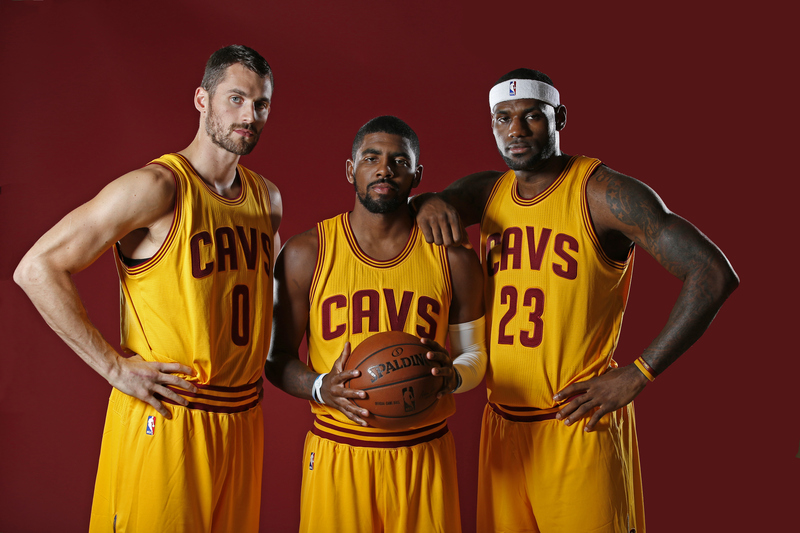 So after telling you not to hit panic on the 14-15 Cavs just yet, and outlining potential solutions (some of which Blatt is already exploring) to the problems, many of them Love related, that have plauged Cleveland thus far, I leave you with one final question: is it time to rekindle the Kevin Love trade talks? January 18, 2015 in NBA.